This month, I’m giving away a Zwilling J.A. 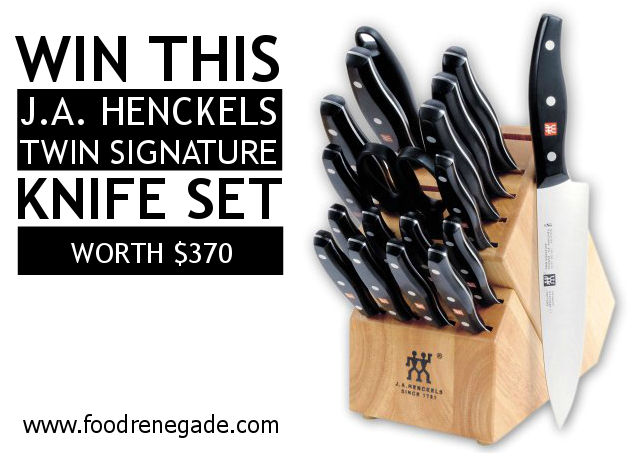 Henckels Twin Signature 19-Piece Knife Set with Block (worth $370) to one of you. This is an awesome giveaway! YOU are awesome. Was there ever an announcement for the January winner of the Amazon giftcard? I think I missed it. raffelcopter widget is not working. I love your blog… it’s such an incredible resource for me. Thanks so much for your generosity with this give-away… I currently use a mismatched set of not-so-sharp knives and could sure use this. Thanks again for all that you do… I appreciate you a lot! set is 24 years old. Wow! Time has flown by in the kitchen. I should clean out the kitchen and evaluate the situation. Raising two boys in music and sports I have been busy. Oh, I hope I win! My knives have all seen much better days. Thanks for offering the giveaway! Great give away! Who couldn’t use a good set of knives? So excited about this giveaway! We have a few random kitchen knives; this set would be so useful! I love the great nutrition ideas and enjoy joining forces with ‘the rebel with a cause’ for safe, healthy eating. i really appreciate the recipes i get from this sight, great variety. what a super giveaway, my mom always said, a great sharp knife is a cooks best friend & boy is she right, thanks. An amazing blog with yet another amazing giveaway. I have never had a knife set although the last couple of years I have been cooking much more and have been painfully aware that my life is missing a fabulous knife set. Anyway, because of your research I have learned about many awesome products and trustworthy brands. Thank you! Love the recipes. Awesome giveaway!! Love your site! You are a good inspiration for eating healthy. Thanks! 50 plus years old and have never had any decent knives! Now that I have found real food, I have also found that to cook well you really do need good knives! I guess all that package opening over the years had me fooled! 🙂 What a great giveaway, thanks for the opportunity! Thanks for the opportunity to win the Henckel Knife set! I have used their knives at friends homes but have not had the pleasure of owning any, so they would be an awesome and cherished addition. BTW,raffelcopter widget didn't seem to work..
Go you!! What a fab giveaway from an even more fabulous site!! Ardent subscriber and reader… love your blog! I’ve truly enjoyed your blog. Always my go-to site when I want some Foodie info. Your Give-away’s are great and very kind of you! Just found your site and looking forward to learning lots! One of the best foodie websites that does NOT advocate the use of industrial feedlot “meat” ( unlike some really famous food websites that I no longer peruse ), gmo products or toxic grocery items in real food preparation! Unfortunately I don’t do google or twitter, but I did enter everything else. I love your posts on FB and follow with emails as well. Thanks for all the great info! I am so happy to have found your website/blog! I so appreciate everything you are advocating and am telling everyone in my life! If we want to save ourselves, we MUST return to the basics so all the chemicals, gmo foods, and very poor farming practices don’t end up killing us! I support you all the way! Dont think the rafflecopter is working right – each day I log in and I have 6/8 entries, then I share the giveaway and I have 8/8. Then I come back the next day and I have 6/8 entries. Shouldnt a person who is sharing every day have an additional 2 entries per day? Sally Inman, are you trying to access it on your phone or computer? I just checked it on my computer and it works. I entered! Thanks for the chance. My husband and I just shared one steak knife left in our old set LOL. I swear the kids threw them away instead of washing them on their dish night. We are empty nesters now, I promise I will be very very careful with these. The Raffelcopter Widget is not working. Thanks for the great giveaway! I have used cheapo knives for my whole life, a new set of GOOD knives would be a blessing! Thanks for the chances to win. I was only able to get the widget to work one time. I was never able to come back and enter posts to FB. Hadn’t seen a winner announcement, and wondering if you’d picked one yet? Thanks!